GLENDALE, Calif., October 14, 2016 /3BL Media/ — Disney Consumer Products and Interactive Media (DCPI) and Dole Food Company today announced plans to launch a new co-branded assortment of fresh produce featuring iconic Disney, Pixar, Star Wars, and Marvel characters at grocery and retail stores nationwide beginning this fall. The announcement comes ahead of the 2016 Produce Marketing Association (PMA) Fresh Summit Convention and Expo taking place October 14-16 in Orlando, Fla. (Disney booth #409, Dole booth #3043), where both brands will have a presence. The two brands will launch its first program this fall, followed by a host of other health and nutrition education programs themed around other Disney, Star Wars and Marvel films and characters in 2017. These programs will include consumer promotions, digital integrations, in-store activities, and themed recipes featuring DOLE products to encourage kids and families to adopt a diet rich in fresh fruits and vegetables. 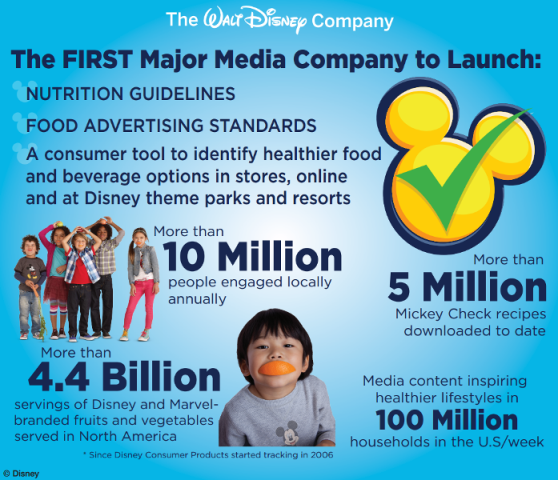 In 2006, The Walt Disney Company became the first major media company to establish a Nutrition Guideline Policy to associate its brands and characters with a more nutritious portfolio of foods and beverages. The company has since marked every year of its Healthy Living Commitment with significant milestones such as becoming the first major media company to launch food advertising standards for kids, launching new content and experiences that inspire healthier lifestyles, and introducing the Mickey Check. The Mickey Check is a quick and easy way for families to identify healthier food and beverage options in stores, on-air, on-line, at Disney theme parks and resorts, and other places where Disney products are sold. Foods and recipes that feature the Mickey Check adhere to the rigorous Disney Nutrition Guideline Criteria. To learn more about The Walt Disney Company Healthy Living Commitment and the Mickey Check, visit Disney.com/HealthyLiving. For more than a century, Dole has served as an unrivaled health and wellness resource to millions of healthy-eating enthusiasts worldwide. Dole is committed to nutrition and nutrition education, and to encouraging the world to adopt a healthier diet including more fresh fruits and vegetables. Dole believes that a diet rich in fruits and vegetables can increase America’s nutritional health and help reverse a number of negative health trends, among them improper diet and inadequate exercise as the leading causes of preventable death. In 2003 Dole established the Dole Nutrition Institute (DNI) specifically to study the health and wellness benefits of fruits and vegetables, and a plant-based diet. Today, DNI remains the world’s most definitive, easily accessible and scientifically validated resource on nutrition and health. In addition, Dole recently established a Director and Department of Culinary Nutrition to translate produce-based research into compelling meals that prove the vital role of fruit and vegetables as the staple of a healthy diet. Dole Food Company, Inc., is one of the world’s largest producers and marketers of high-quality fresh fruit and fresh vegetables. Dole is an industry leader in many of the products it sells, as well as in nutrition education and research. For more information, please visit dole.com.